An Indianapolis food-delivery startup called ClusterTruck is tweaking the food-delivery model and taking aim at some of the foundational issues within the space. Essentially, ClusterTruck is a collection of different menus or “virtual food trucks” that are all cooked in one central kitchen. When the order of pad Thai, burgers, tacos and/or barbecue is done, it’s handed off to a ClusterTruck driver for an extremely fast delivery. “It’s about six minutes, we get really, really disappointed if your food is eight minutes old,” said Founder/CEO Chris Baggott. From order to delivery, the average time for the company is just 21 minutes—20 minutes faster than the industry average reported in a Food On Demand and SeeLevel mystery shopping study. Their answer to the big soggy fry dilemma is delivering faster than the fries have time to steam. Like much of the industry, the key to the business is the underlying technology. The integrated kitchens, technology and logistics, Baggott believes, could add up to a billion-dollar business. And he knows a few things about unicorn businesses. He founded Exact Target and Compendium; the former acquired by Salesforce for $2.5 billion and the latter acquired by Oracle for more than $870 million. Baggott said he designed the vertically integrated operation around delivery after seeing first hand the various issues with the typical food-delivery process. After selling his tech companies, he got into farming and then into restaurants with a burger concept and a gastro pub just as third-party delivery was getting started. He said for a business making 8% margins, paying a 30% fee doesn’t make sense nor does losing control over a traditional kitchen when it’s hit with both diners and delivery orders. But for someone who was so successful with customer data, losing that may be more damning. “The second Grubhub acquires that customer, they no longer become my customer and they start selling them competitors’ burgers,” said Baggott. He said another key part of the vertical integration is the driver. It’s still a gig job, but drivers never leave the car. They pull up to the ClusterTruck facility, take the food and hand it off to the end customer at the curb. 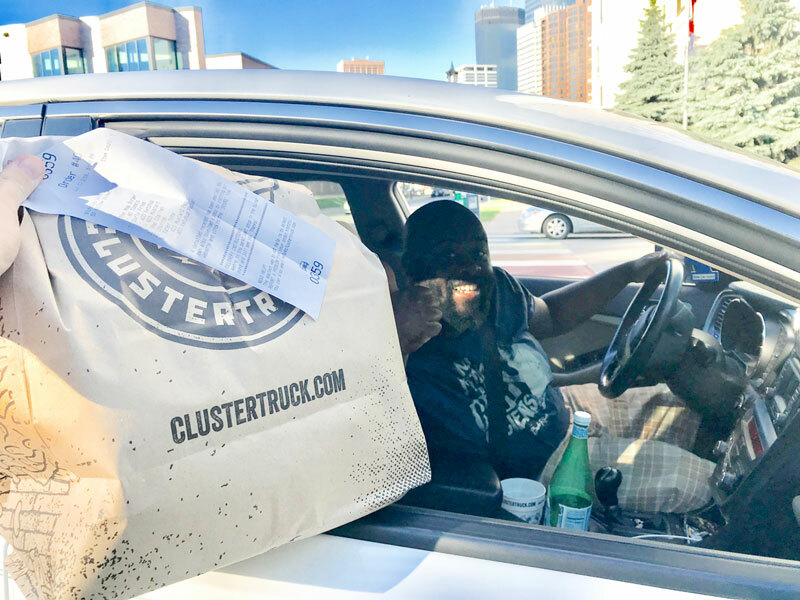 Because ClusterTruck only delivers within a six- to eight-minute driving radius, they can typically complete many more jobs than a normal food-delivery gig where they would have to drive further, park and wait for food at restaurants. To keep orders flowing, the kitchen is all about timing and logistics. When an order comes in, it shows up on a central station. Then the algorithm goes to work, gauging where the driver is, how long each menu item will take to cook and deliver. 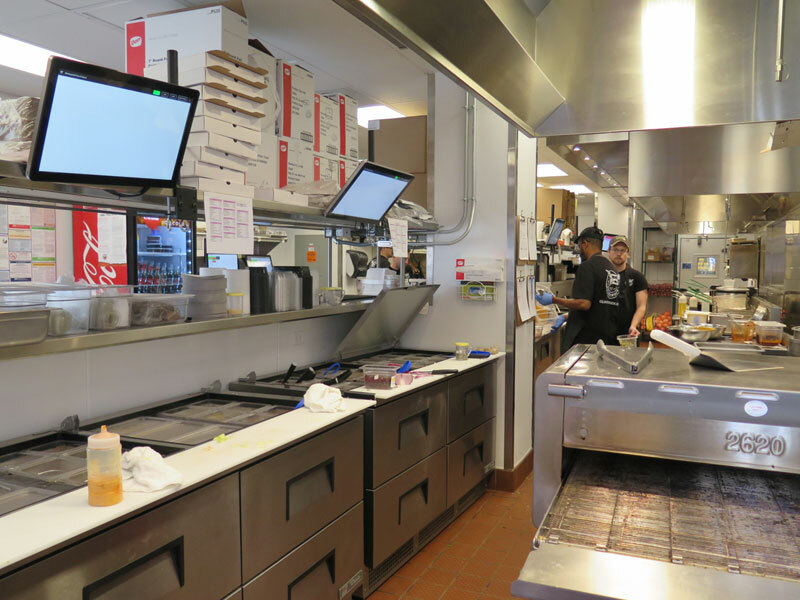 When the time is right, the software alerts the cooks, who cook based on station—there’s an Asian food station, a pizza station and a burger station all running in tandem. All the food has been designed for the packaging and to stand up to delivery—even a short one. Once the order is put together, the expediter or chef hands it to a driver to deliver. At the Minneapolis location, the kitchen was built inside a parking garage in the first location in a partnership with LAZ Parking, the second-largest national parking garage in the U.S. The first driver in line takes the order to the customer and drives back for another order with the software timing their return time so it can get the next order going. Minneapolis general manager Anton Winter said the garage solves a lot of issues that earlier ClusterTruck locations had. The company now has six locations, which Baggott says helps prove out the concept in different climates and different cities—the largest city being Denver and the coldest being Minneapolis. The company is taking a short break from adding new locations and honing the model now. The headquarters staff is also growing, and the company recently announced it would invest $1.4 million on a new downtown Indianapolis headquarters, adding 125 jobs in support staff and local operations. Baggott said while they fine-tune the model and enhance operations, he’s pondering licensing the technology or exploring franchising opportunities. So far, the company has raised $10 million in an initial venture capital round.